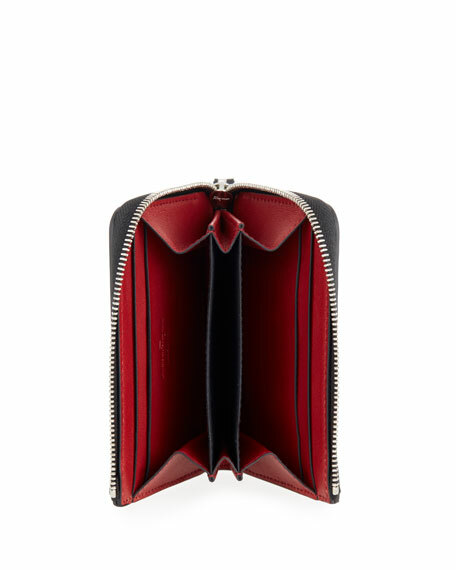 Salvatore Ferragamo wallet in Revival textured leather. Silvertone Gancini logo detail at corner. Salvatore Ferragamo pebbled leather business card case. Bifold flap opening. Tonal Gancini logo at front base. One compartment; five card slots. 3"H x 4"W x 0.8"D. Made in Italy. 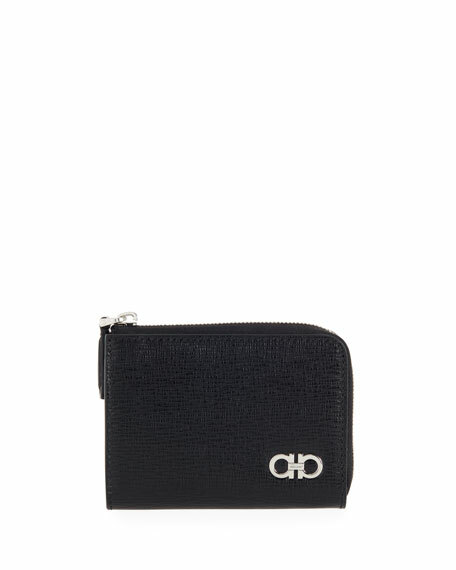 Salvatore Ferragamo bi-fold wallet in Giano studs detail. Six card slots; two bill slots. Cow leather. Made in Italy. Salvatore Ferragamo bi-fold wallet in lizard-embossed calfskin leather. One bill compartment, six card slots, and two slip pockets. Metal Gancini detail at corner. Made in Italy. Salvatore Ferragamo "Revival" bi-fold wallet in textured calf leather. Golden Gancini detail at corner. One bill compartment; six card slots; two receipt slots. Made in Italy.